This morning, Ms. Tina was able to share at the Earthquake School of Supernatural Ministry about her story and dreaming with God. It was amazing to share about how Turning Pointe came to be and to encourage people in their faith that God can do so much more than we can ask or imagine! Next we went to a 2 hour salsa class at Danzarte Estudio in San Salvador taught by Patty Barrios. This is a dance studio that also offers painting, karate, robotics, and music classes. Crazy enough, Danzarte performed Hairspray the musical this past December! It was so fun to see pictures of their special rendition. We all entered the studio with excitement and learned "how to use our hips in public (quote by McKenna)." We learned a crazy combo that had us all sweating within the first 15 minutes of our 2 hour class. We were so blessed by Patty's expertise. After our dance class, we ate lunch and then went to Tia Ana's house. Tia Ana's house is a home for kids whose parents are still living but do not want them for various reasons. There are about 23 kids in the home right now ranging from almost 2 years to 20 years old. We passed out little toys, performed a couple of dances, drew with chalk on all the walls (and each other), and hugged on little kiddos who need to know that they are loved. "You feel so sorry for the kids on one end, but how do you explain to the kids about their heavenly father when their fathers are absent or abusive? They are so eager for a father that loves them. I cannot fathom all the fathers that don't understand these kids want someone to play football with them in the street...something as simple as that...to be absent for that is hard to believe. "- Aaron P.
Again we were so honored and blessed to be able to serve Tia Ana today. She is so much like Jesus and her vision to bring in the forsaken very much reflects the Father's heart. On Thursday we visited Josue Cristo, a Christian school in the town of Ataco. The students were so eager to participate whether that was in tag or dancing with us. We were so blessed by their sweet hearts. “I met this boy who God had been telling me to pray for before we even came on the trip and I met him at this school. I asked him about his relationship with Jesus and he told me that he had known him when he was young, but he had gone to a dangerous school and had fallen away from the Lord. The translator and I shared a bit of the gospel with him and told him that this gift is a free gift but it’s also a choice. He told us in turn that it was a hard choice to make. I hugged him and told him that God loved him and then we left. It broke my heart knowing that we might never see the outcome of the seed planted in his life. More importantly it broke my heart because God told me how he felt about this boy.” – Emma G.
“At the school I met this boy named Niko and he has Down’s syndrome. I was praying for him during the show that he would be receptive and understand. Afterwards, I got him to dance and he was just so happy. When I was watching him during the show he was sitting still the whole time and engaged and entertained. 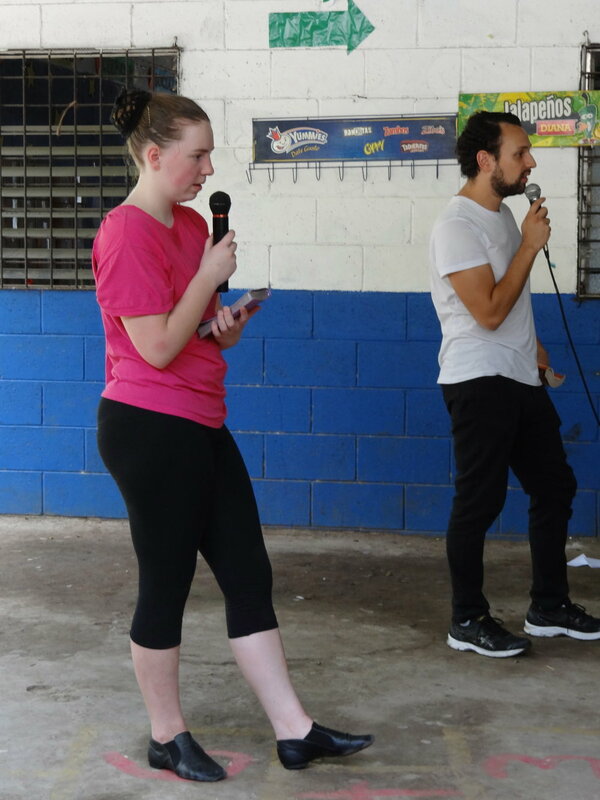 It made me realize that in El Salvador I don’t know how kids with special needs are perceived, but he had so much joy and brightened my day.” – Lindsey C.
After ministering at Josue Cristo we had a grand adventure…ziplining in a torrential rainforest downpour! It was AWESOME! After drying off and moving into the cabins of Jardin de Celeste, we experienced the small town vibes of Ataco. We finished up the evening with a scrumptious dinner at La Pampa. This day made us so much more excited about what the Lord is doing in El Salvador. He is moving mightily! We made it! After 8 months of preparation we are finally here and we hit the ground running. Our first day of travel went so smoothly even though our first flight was delayed, the Lord orchestrated all of the details and we arrived safe in El Salvador in the evening. We are so thankful for how He is already teaching us to be flexible and trust Him. We are staying at a lovely hotel with a mountain as our view on one side and a pool as our view on the other side...we aren't in Colorado anymore! For our first day we returned to El Tunco and Remar orphanage. We had a quick trip to the beach in between to eat lunch. El Tunco is a beach village with a really bizarre mix of tourist attractions and extreme poverty. We had the honor and privilege of ministering at an elementary school in El Tunco. Amazing Love Missions has been serving at this school for 10 years including helping with purification of the water for the students so it was incredible to partner with their legacy. El Tunco will probably be one of the hottest sites we go to...yet the dancers did so incredible in committing to on the fly spacing changes and interactions with kiddos. “As soon as I saw a boy named Andres I knew we had a special connection. He was a very shy boy and seemed to drift between many groups. We bonded over playing catch with a little yellow ball. After a few minutes of playing his guardian told him to go inside. I was devastated with the fact that I wouldn’t get to say goodbye. But on our way out, I got to see him one last time. Both of our faces lit up at the sight of each other. 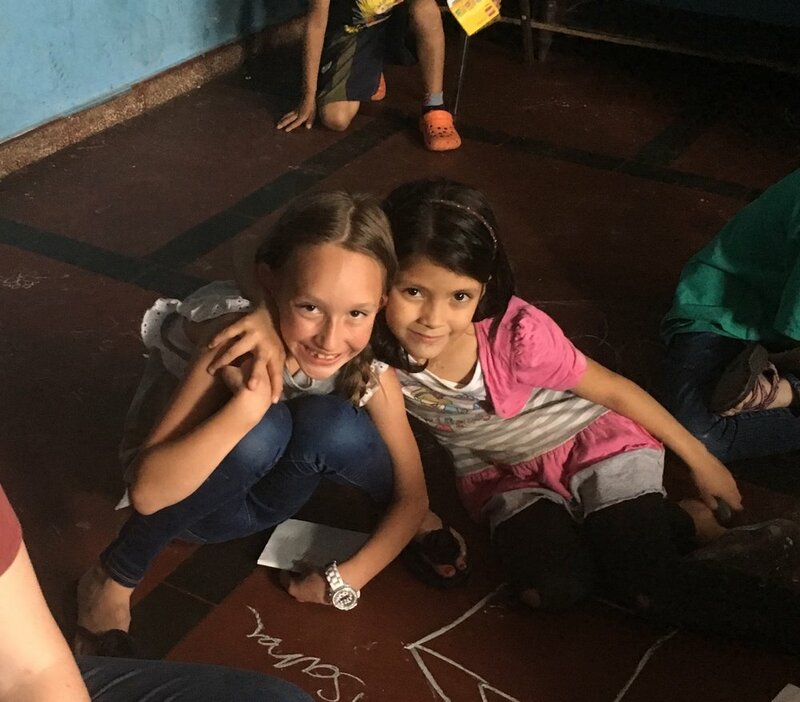 He made leaving Remar incredibly difficult and I’ll never forget seeing him standing outside the orphanage watching us drive away.” -Emmy V.
After a quick trip to the beach, we headed to the Remar Orphanage also in El Tunco. This orphanage houses about 60 kids all from different backgrounds and stories. They were a very receptive audience and that plus the sizzling cement made for an incredible show. "There is a sweet 8 year old girl whose name was Fanny and we drew pictures that were yellow because that was her favorite color. It was cute how the kids wanted to share the English words that they knew with us." - Kerstin L.
None of us were ready to leave both the El Tunco elementary school and the Remar orphanage. We are so thankful for how the Lord is working through us, in us, and beyond us. What an honor it is to serve the Kingdom! 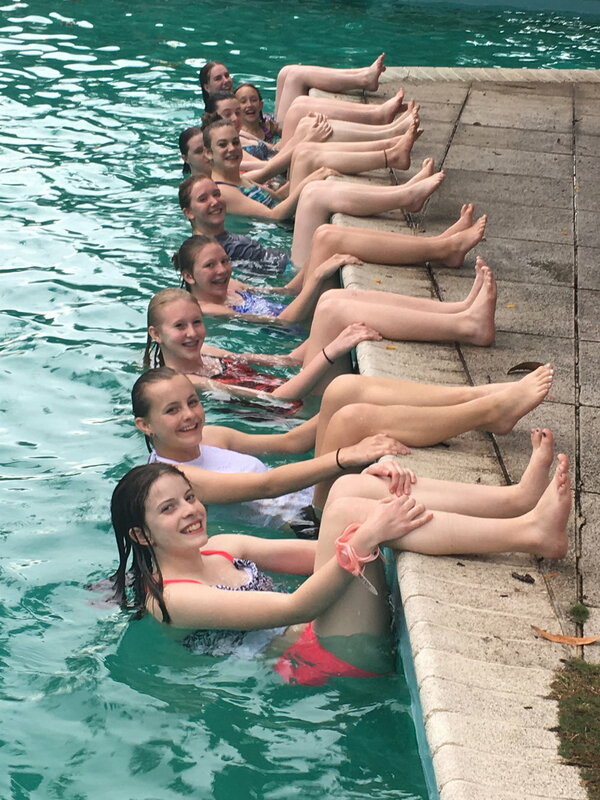 Our team of 18 Turning Pointe dancers, parents, and teachers are preparing to travel to El Salvador June 6-13, 2017 to share the love of Christ through dance, drama, and personal testimonies. This is something so unique to our studio because we get to use both our faith and our gifts in action! We have the opportunity to take all of those lessons at the ballet barre, all of the years of technique we've learned, and all of those life lessons in perseverance and flexibility and put those into practice by performing in the heat and humidity sometimes on dirt and slippery tile, and by looking into the eyes of a child and telling them that they matter and God loves them. To prepare our hearts for this mission, we recently participated in a day of low ropes to bond as a team and learn about communication, trust, and consideration. It was amazing to see how the team bonded, learned each others names (including middle names), and worked together to be good leaders and good listeners. We want to say THANK YOU to our Turning Pointe family and friends for sending us and for supporting our team financially and through prayer. We will be posting pictures and blog updates from our travels and experiences right here on this page and hope that you all will follow and be encouraged! Please be praying for safety and health for our team. Pray for hearts to be open and lives to be changed. Pray for boldness and courage in each of our students. Gloria a Dios!